Arena rock is celebrated by Boston in impressive outing before sold-out crowd. It was on Saturday night, when a capacity crowd journeyed back to the late 1970s with Boston during a satisfying stop at Pacific Amphitheatre in Costa Mesa. To hear a band that scored its biggest hits almost 30 years ago sound as good as Boston did over the course of 2 1/2 hours was impressive. Classic arena rock nuggets such as "More Than a Feeling," "Peace of Mind," "Smokin'" and "Something About You" equaled their magic on the band's legendary 1976 debut album, but the bigger surprise was that tunes from Boston's second and even third album sounded just as Herculean. 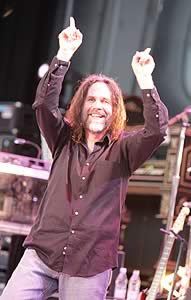 Even power ballads such as the admittedly overwrought "Amanda" and "Hollyann" worked in a concert setting because of the emotive vocals of Brad Delp and powerful contributions from the players. The songs alone might have pleased the majority of the sold-out crowd, composed mostly of 40-something fans who were in junior high or high school when "Boston" (which has sold more than 17 million copies) was released on Aug. 8, 1976. But Boston's lineup of talented players was thankfully not content to simply play an hour or so of hits featured on the group's greatest hits collection and say goodnight. As innovative as any arena rock guitarist of his generation (with the notable exception of Queen's Brian May), Boston mastermind Tom Scholz gave sonic fuel to many in the seats playing air guitar during the more famous solos. Although only Scholz and Delp remain from Boston's original lineup, the other five musicians that comprised the touring outfit were able to complete the songs fully with a mix of layered guitars, keyboards and vocal choruses. Singer-guitarist Fran Cosmo would often help reach the highest of notes when Delp couldn't, while guitarists Anthony Cosmo (Fran's son) and Gary Pihl enhanced a sound atop the rhythm section provided courtesy of singer-bassist Kim Dahme and drummer Jeff Neal. Opening with an aptly placed "Rock and Roll Band," Boston went on to perform more than two dozen other original songs. Highlights came often and kept fans on their feet for much of the night. During "More Than a Feeling," the crowd needed no prompting to sing along, while forceful performances of "Don't Look Back," "Cool the Engines" and "Foreplay/Long Time" easily outdistanced the original studio versions. By the time Boston closed with "Smokin'," there were plenty of reasons to believe this was a concert experience that made arena rock worth celebrating again. First the great news about the Police officially reforming to play the Grammys and tour this spring and summer (can't wait! I'll see many of you at Dodger Stadium in June). Now, the original four members of R.E.M. (singer Michael Stipe, guitarist Peter Buck, bassist Mike Mills and ex-drummer Bill Berry) got together in the studio last year to record a cover of John Lennon's masterwork "#9 Dream" as part of a charity collection titled "Instant Karma: the Campaign to Save Darfur." I'm sure the band's recording (which goes out to radio this week, with the album itself set for release on June 12) is great and I can't wait to hear it. As most of you know, I rarely talk about politics in this column. In fact, I am happy that R.E.M. and a number of other bands are (finally) working with Amnesty International to try to bring some attention to the terrible genocide going on in the Darfur region of western Sudan. I recall doing a story several years ago (2003, as I recall) about Costa Mesa-based singer-songwriter-composer Ken Tamplin, producer of the Sudan relief CD "Make Me Your Voice," an effort that got very little attention in the mainstream media. In fact, Tamplin was honored by President Bush for his efforts and I suspect because so many of the victims have been black Africans and/or Sudanese Christians and those doing the killing are mostly Muslim that the world has been afraid to speak out. I think it would have been good for the U2s and R.E.M.s to focus on Sudan five or six years ago, and now I fear by the time something is done it will be too late. And I fear the world has lost its resolve to use force to stop the terrible murders and rapes going on in Sudan so it will be the killers who ultimately determine when the crimes stop. And that it a timeline that means innocent men, women and children will continue to die for far too long.